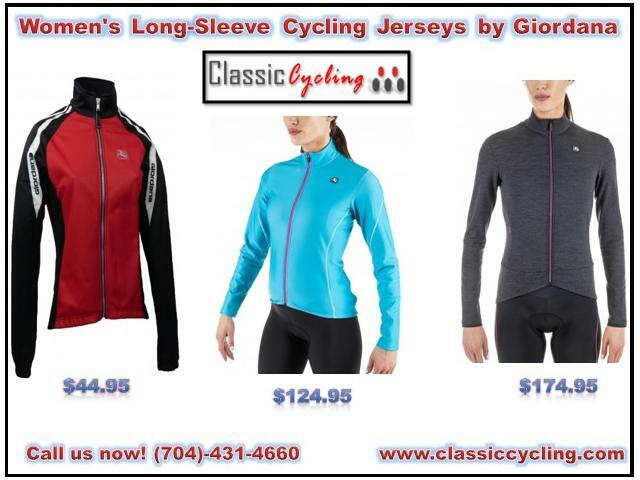 Shop our selection of long-sleeve women's jerseys for cold-weather bike riding by top brands such as Castelli and Giordana. Full zipper with pull tab. Reflective piping and logos for visibility. Michron inserts under the arms add ventilation. Giordana logo elastic hem at the waist. Recommend for temperatures 45-60 degrees Fahrenheit. Mid-weight and ergonomically cut, the Fusion Long Sleeve Jersey is tailored to have a more relaxed overall fit. Made from a microfiber polyester/spandex fabric, the Fusion has a brushed low loft interior, is breathable and has ample stretch to ensure the perfect fit. Pixel® reflective piping adds visibility at the rear pockets. The three rear pockets are augmented with a fourth, secure zippered pocket. The Sosta Long Sleeve Wool Jersey is a modern take on the classic jerseys from the golden age of cycling. Wool jerseys ruled the day for racers and tourists alike for the greater part of the twentieth century. The new Sosta Long Sleeve Jersey brings that look back with a contemporary twist. A new fabric, Koln, uses a blend of Merino wool and nylon in a lightweight knit. The wool content provides warmth without overheating. It draws moisture away from the skin keeping the wearer comfortable in warm or cold conditions. The nylon makes care easier and allows for a modern day fit. The Koln blended with Merino Wool is naturally door resistant, wicks moisture and provides UV protection.